I have read very few steampunk books but I tell you thi tops over everything I have read so far. 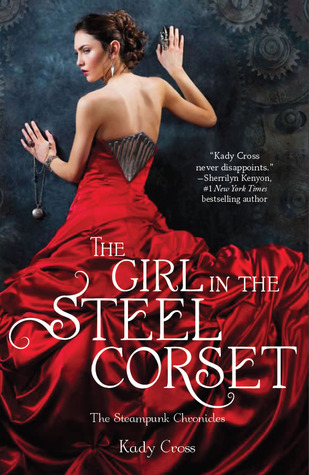 Presenting Steampunk Chronicles #1 The Girl in the Steel Corset by Kady Cross. The events here follow straight after the novella, The Strange Case of Finley Jayne. Finley's dark side rears it's head when she is in trouble, sometimes it gets her in trouble with the ones who employ her. This is where The Girl in the Steel Corset begins. Finley after a gruesome encounter(I don't think I need to describe the nature of it) with the son of her current employer runs for her life straight into Lord Griffin King of Greythorne and his companion Sam. They are there looking out for an enemy, the clever and cynical, the Machianist. Griffin, Sam and his group including Emily and Jasper take her in because Griffin King sees the magical darkness in Finley and promises to help her. Also his group is special and Griffin sees that she is also special..and one of them. To elaborate Griffin can walk the astral plane and calm a wayward or a distraught soul, Sam is part automaton and is very strong, Emily is the mechanical expert and can talk talk to the bots, and Jasper, an American Cowboy, although is not a permanent member but he has great speed and knows martial arts. All in all they are not much more different than Finley. They take her in help her connect to her dark side. Histories are revealed. Alliances are formed, and amongst all of this th Machianist is playing a dangerous game that threatens the stability of the British crown itself. Very Apocalyptic...the stakes are higher than ever. A solid narrative, the perfect use of steampunk and supported some sold character, this is a power packed and tight story. There is everything in here, friendship, comfort, first love, jealousy, great action, the perfect London atmosphere with a cynical villain running around reeking havoc. All this is helped along by the characters Griffin, Finley, Sam, Emily, Jasper, The Machianist. In every ways they complement each other to bring this narrative to fruition. Griffin with his need for vengeance, Finley looking to belong somewhere and finding out what she actually is, Sam with his insecurities, the soft spoken Emily tinkering with her machines, Jasper with his long winded past and the cynical villain with his need for revenge on the Queen. Kady Cross you are my new favorite, I'm so checking out the Girl in the Clockwork Collar next. "An action packet dark and medieval England"
This has been on my wishlist since it came out--obviously I really need to read it! There just isn't enough steampunk in my life. Great review!